Major General Kenneth David Nichols (13 November 1907 – 21 February 2000), also known by Nick, was an officer in the United States Army, and a civil engineer who is notable for his classified works in the Manhattan Project, which developed the atomic bomb during World War II, as Deputy District Engineer to James C. Marshall, and from 13 August 1943 as the District Engineer of the Manhattan Engineer District. He was responsible for both the uranium production facility at the Clinton Engineer Works at Oak Ridge, Tennessee, and the plutonium production facility at Hanford Engineer Works in Washington State. Nichols returned to the United States in 1931 and went to Cornell University, where he received a bachelor's degree in civil engineering. He became assistant to the Director of the Waterways Experiment Station in Vicksburg, Mississippi, in June 1932. In August he continued his studies at Cornell, where he completed his master's degree in civil engineering on 10 June 1933. While at Cornell he married Jacqueline (Jackie) Darrieulat. Their marriage produced a daughter (Jan) and a son (David). He returned to the Waterways Experiment Station in 1933. The next year he received a fellowship awarded by the Institute of International Education to study European Hydraulic Research Methods for a year at the Technische Hochschule in Berlin. While there he was promoted to first lieutenant on 1 October 1934. The thesis he wrote won an American Society of Civil Engineers award. On returning to the United States he received another one-year posting to the Waterways Experiment Station. From September 1936 to June 1937 he was a student officer at Fort Belvoir, Virginia. He then became a student again, using his Technische Hochschule thesis as the basis for a Doctor of Philosophy degree from the State University of Iowa. He became an instructor at West Point in August 1937, where he was promoted to captain on 13 June 1939. Shinkolobwe mine in the 1940s in Belgian Congo - described by a 1943 Manhattan Project intelligence report as the "most important deposit of uranium yet discovered in the world". The uranium from this mine was used to build the bombs dropped on Hiroshima and Nagasaki in 1945. Nichols was promoted to brigadier general on 22 January 1946. Following the departure of Major General Thomas Farrell, Nichols became Groves' deputy, although he also continued as district engineer. 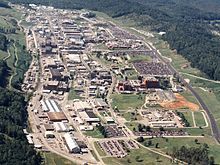 Asked to spend more time on weapons production and storage, Nichols established a new underground assembly plant at the Mound Laboratories in Miamisburg, Ohio, and recommended that Sandia Base be transferred from the United States Army Air Corps to the Manhattan District. In December 1946, Nichols recommended the closing down of the alpha tracks of the Y-12 plant, thereby cutting the Tennessee Eastman payroll from 8,600 to 1,500 and saving $2 million a month. Henceforth, uranium enrichment would be performed by the gaseous diffusion plants, the wartime K-25 and the new K-27, which had commenced operation in January 1946. Lilienthal objected, but Nichols pointed out that the proposal had been included in their briefing when the commission visited Oak Ridge in November. But in January 1948 he returned to the army to replace Groves as chief of the Armed Forces Special Weapons Project (AFSWP), as the Navy and Air Force were vetoing each other’s candidate. On 11 March he and Lilienthal were summoned to the White House where Truman told them "I know you two hate each other’s guts". Truman directed that "the primary objective of the AEC was to develop and produce atomic weapons". Lilienthal was told he would have to "forgo your desire to place a bottle of milk on every doorstop and get down to the business of producing atomic weapons". Nichols had been looking forward to "a long relaxing career as a professor during a long period of peace" but saw increased tension with the Soviet Union in February and March. In April 1948, Nichols was appointed to command the AFSWP, with the rank of major general, becoming the youngest major general in the Army at the time. Although his rank entitled him to quarters at Fort Myer, Virginia, the Chief of Staff of the United States Army, General Omar Bradley advised him not to ask for them as there had been criticism from some senior colonels. Nichols also became Senior Army Member of the Military Liaison Committee to the AEC, and Deputy Assistant Chief of Staff of the Army (G-3) for Atomic Energy. Nichols left the Atomic Energy Commission in 1955 and opened a consulting firm on K Street, specializing in commercial atomic energy research and development. His clients included Alcoa, Gulf Oil, Westinghouse Electric Corporation and the Yankee Rowe Nuclear Power Station. Nichols was involved with the construction of the Yankee Rowe Nuclear Power Station, the first privately owned pressurized-water plant, and the Connecticut Yankee Nuclear Power Plant, which commenced operation in 1961 and 1968 respectively. They were both experimental and not expected to be competitive with coal and oil, but later became more so due to inflation and large increases in coal and oil prices. He was critical of over-regulation and protracted hearings, which meant that by the 1980s similar boiling-water or pressurized-water plants took almost twice as long to build in the United States as in France, Japan, Taiwan or South Korea. ^ Nichols 1987, pp. 249,257. ^ a b Nichols 1987, pp. 244-247. ^ Nichols 1987, pp. 243-244. ^ Nichols 1987, pp. 257-259. This page was last edited on 2 March 2019, at 01:04 (UTC).